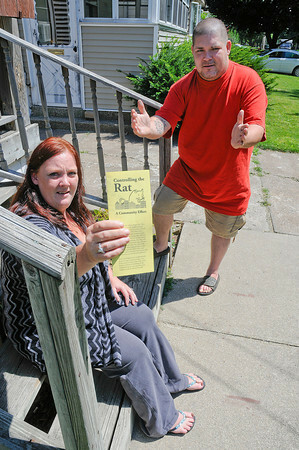 James Neiss/staff photographerNiagara Falls, NY - Residence in the 5200 block of Stephenson Avenue, Salli Denney and Chris Baker both said they have problems with rats, big ones according to Baker. "It's getting out of hand. I don't know what they are eating but they're big." Denney shows off a flyer that the health department gave her during a recent door to door campaign.